Macbeth, Julius Caesar, Twelfth Night. These famous plays and 15 others by Shakespeare would probably have been lost to us without the First Folio. Published in 1623, the First Folio is the first collected edition of Shakespeare’s plays, and only 233 copies are known today. To mark the 400th anniversary of Shakespeare’s death, the Folger Shakespeare Library is sending a First Folio to every state in the United States; the Beach Museum of Art was selected as the venue for the Folio’s display in Kansas. 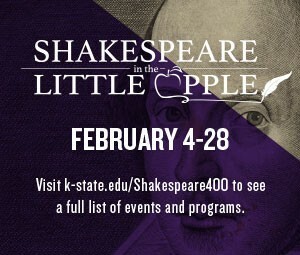 Join us through Feb. 28 in celebrating all things Shakespeare! The First Folio’s visit is accompanied by a series of campus and community events celebrating the First Folio and Shakespeare.